When I was writing my review of the Harbor Freight Cen-Tech Digital Angle Gauge I realized I hadn't really used it for anything other than setting my tools to 90 degrees. So I took a quick survey of what wood supplies I had in the garage. Hmmm... I have a few boards of purpleheart, some "hobby wood" curly maple boards from Lowes, some scraps of poplar, a bunch of redwood... I got nuttin'. As I walked into my bathroom I found my wife had used some fugly light blue plastic drinking cups to put Q-tips in. *MY* bathroom! The horror! I realized then I had to make me a Q-tip holder that would look nice in my bathroom on my redwood shelving. But I really didn't want to make it out of redwood. That wood is so brittle I cringed at the thought of getting accurate angles without splintering. 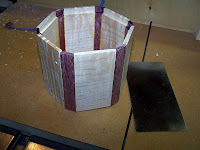 But 1/4" maple with some purpleheart strips would be nice! And a perfect use for my angle gauge! I decided on a hexagon shape, using six strips of purpleheart cut with a pair of 60* angles on the long sides and 1 1/2" strips of curly maple. That was easy enough. But the maple cuts weren't. 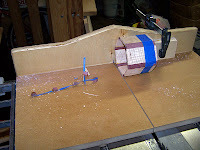 I have a large crosscut sled I made for making some table miters when I first got this saw. But it is really unwieldy when using for small parts. So I had to make a small 48" x 24" crosscut sled. No construction pics, but it's 3/4 MDF with doubled up 1/2" birch ply for the handles. Simple, sturdy, and accurate. It also makes me feel MUCH more comfortable cutting small parts on the table saw. Especially using the David Marks trick of a pencil eraser as a hold down. Back to the original project. I cut the maple so the curls ran vertical and the grain horizontal. This gave me less splintering in the curly maple when using a card scraper. But it also increased the risk of grain separation because I was scraping across the grain. I don't know that either orientation would be easy. But I liked the appearance of the vertical ripples. I set up my router table with a 1/4" straight bit, set 1/8" high with the fence 1/4" from the front of the cut. This gave me a 1/4" x 1/8" rabbet to set the bottom of the cup into. I ran all the maple as well as the purpleheart through the router. 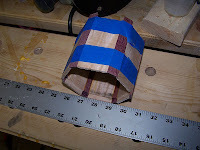 I placed two strips of blue masking tape, sticky side up, on my bench. I then clamped a straight edge to the bench a little ways below. The straight edge was the register for my parts to keep them aligned and give me a cup that is square to the world. Once I was happy with the alignment, lack of gaps, and the test fit went well, I brushed Titebond II on all the joints and rolled it up. The overlaps of tape held it together and acted as a clamp. No strap clamp needed on such a small piece. I left it to dry overnight. 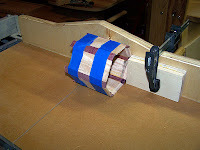 The next day I set up my sled again to trim the proud bits of purpleheart. The sled really came into its own for this part since I needed to make 6 identical cuts. I used my cabinet scraper to clean up the outside of the cup and ease the edges, gently rounding the joints between the maple and purpleheart. 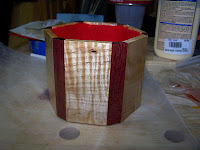 To fit the bottom I used a scrap of 1/4" poplar with the outside of the cup traced to it. I rough cut it on the bandsaw then used 60 grit sandpaper to fit in the rabbet around the bottom of the cut. Once it fit I used a cabinetmaker's triangle to mark the correct orientation then set it aside. I sealed the inside of the cup and the bottom as separate pieces with some Zissner SealCoat. I'm trying to use this stuff up before it goes bad. It's the same stuff I put on the crosscut sled I made during this project. I don't like how it looks compared to "real" shellac, so I use it in places that aren't seen, or I don't care how it looks. I have started mixing my own shellac from flakes distributed by Hock Finishes and denatured alcohol. The lensing effect of the home mixed shellac is far superior to that of any of the canned finishes I've tried so far! After two coats of the Seal Coat had been applied and dry, I applied self adhesive felt to the inside surface of the bottom and the inside of the cup. Yes. It's red. So sue me. This self adhesive felt is available at WalMart for around a buck for an 8x10" sheet. It took about 3/4 of a sheet for this project. And it was my last sheet of any color (that's why I used red). I need to stock up again. Once the adhesive had a chance to become permanent, I trimmed around the rabbet and lip of the cup with an X-Acto knife. I double checked the fit of the bottom. It fit a bit proud, as I expected because of the felt. I brushed on the glue and clamped it for an hour. Finally, I hit the bottom with my belt sander to make the bottom flush with the sides and applied 2 coats (so far... more to come tomorrow) of my home mixed shellac in a 3 pound cut. I brought it inside to hopefully harden completely before tomorrow morning so I can smooth the finish with some 400 grit paper and apply 2 more coats. While I was sitting in my chair holding it and admiring (we all do that right? I'm not crazy? Hello? Anybody? ), I realized I had made it too big for Q-tips. I'd have to have a full package in there all the time. Ugh. So I set it on my purpleheart and maple side table (noticing a trend?) and picked up a Lee Valley catalog to let my mind wander for a few minutes. My 4 year old daughter came up and dropped a remote in it. "Nice, Daddy! A new remote holder!" She ran off to do whatever 4 year old girls do when they run off. I, on the other hand, was stunned. Why the ! @#%@$^# hadn't I thought of that? The wife had been kvetching about the remotes for months. Somehow she thought getting Dish would mean only one remote. I know, I know. What can I say? Don't your wives hate the remotes too? 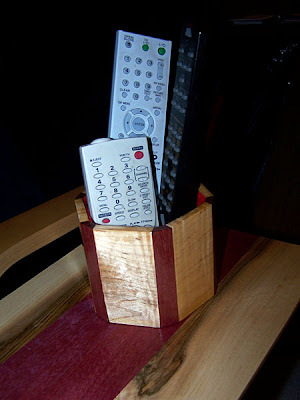 Anyway, it now has a permanent place in the living room on my maple and purpleheart side table. At least it matches. And I still have an ugly light blue plastic drinking cup in my bathroom. But now its mate has come down to hold Neosporin tubes. Why can't she just stay out of the Guy's bathroom?